Netroots wizard Joe Trippi is one of a group of American campaign consultants descending on Baghdad in hopes of shaping the March elections and the shape of politics to come. The violence in Iraq may have subsided of late, but the political combat is on the rise. This week, the country’s election organizers will officially bar nearly 500 candidates from seeking office—most of whom are Sunni, a move that has enraged the Sunni community. Boycotts have been threatened, and protests planned. Amid the tumult, a new kind of American hired gun has arrived on the scene: U.S. political consultants—netroots wizard Joe Trippi the most prominent among them—with plans to shape the emerging political landscape by electing moderate voices to the national parliament. “We are a young democracy, and so we asked our friends from the best democracies in the world to support us,” says Ayad Jamal Aldin. Trippi, immortalized as the guru behind Gov. Howard Dean’s grassroots run for president in 2004, is working for a 50-year-old Shiite cleric named Jamal Ayad Aldin, who heads up a list of 291 candidates for the newly formed Ahrar party. The pitch for his candidate—Ayad Jamal Aldin is a rare, secular, pro-Western Shiite cleric whom Trippi describes as a “fresh face” and “a straight talker,” like “the old John McCain from 2000, not the John McCain from 2008”—comes during the first (relatively) normal campaign season Iraq has had since the U.S. invasion in 2003. During the last national election in 2005, candidates avoided the spotlight, fearing for their lives. Four years later—and with the aid of hired consultants and firms from the West—a number of Iraqi politicians are trying to master the democratic art of keeping the spotlight trained on themselves, this week’s upheaval notwithstanding. Iraq is just the consultants’ latest emerging market; international political consulting is approximately a $1 billion a year industry, according to Tony Marsh, who runs the Washington, D.C.-based firm MarshCopsey, which produced campaign ads for the regional elections last summer in Iraqi Kurdistan. James Carville, for instance, does much of his work overseas nowadays—he consulted in the August 2009 elections in Afghanistan for the moderate Ashraf Ghani. (Though not involved in the Iraq elections, Trippi and Carville did run dueling campaigns in Greece back in 1993. Trippi’s candidate won.) Trippi has also worked in Italy and Zimbabwe. In part, Trippi’s campaign for Ayad Jamal Aldin is about introducing a new brand. Jamal Aldin has been a figure in Iraqi politics since 2003—he’s also a member of the National Assembly—but he started his own party, Ahrar, in October 2009. Ahrar—which means “free” in Arabic—hopes to win at least 12 to 14 seats in the elections. According to General Nabil Khalil Said, the No. 2 man on the Ahrar slate, Jamal Aldin is ready to spend about $10 million on the campaign, paid for from his own pocket. There are at least four other prominent candidates who’ve brought on American and European firms. Sheik Tariq Abdullah, a Sunni businessman and parliament candidate who has hired the D.C. firm Opinion Makers International, said his campaign was prepared to spend $10 million. Iraq’s minister of interior, Jawad Bolani, had recently employed the services of the New York and London strategic communications firm Brown Lloyd James, and reportedly is preparing to spend $15 million. Prime Minister Nouri Al-Maliki has hired a Swedish firm, according to a source close to the prime minister, though it’s unclear how much he’s going to spend on his campaign. Longtime U.S. favorite and former Prime Minister Ayad Allawi has asked a well-known American polling firm to run his campaign, according to a source on Allawi’s list. On Saturday, Allawi announced his own coalition, made up of both secular Sunnis and Shiites, which could rival Prime Minister Maliki’s party. Bringing in the American backup is not without risk. There is a perceived danger in hiring foreign firms, a fear of being seen as a Western stooge. That’s why, officially, Bolani, Allawi, and Maliki deny they’ve hired outside help. (Though, in Bolani’s case, it’s hard to deny press releases sent to journalists with the name of a Western public-relations firm on them.) Questions of credibility and independence are sensitive topics for an Iraqi government that exists in its present form almost entirely due to an American occupation and continued U.S. intervention, while other mainstream political parties like the Islamic Supreme Council for Iraq and the Sadr Trend are heavily backed by Iran. Ayad’s team has also posted YouTube videos, reached out to the Western media, and is planning to make use of text messaging (mobile phones are the primary means of electronic communication in Iraq). The TV ads will air on local channels as well as on satellite television. They’ve also conducted polling—including a recent survey of 2,600 people across Iraq—which rated government corruption as the top issue. Corruption gets at the ever-present security fears in the country; during a recent car bombing, the attackers bribed the guards at three checkpoints to get the explosives through. Despite the overall decline in violence, Baghdad is still Baghdad, and Trippi and Co. know that working in-country carries real risks for them, as well. Daily attacks persist and government officials are the frequent targets of assassination. On his last trip here in December, Trippi awoke in the middle of the night to the very disturbing sound of a bomb blast. The candidate, Ayad Jamal Aldin, has already survived six assassination attempts during his time in public office. 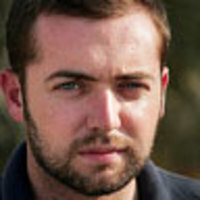 Michael Hastings is a regular contributor to GQ and the author of I Lost My Love in Baghdad: A Modern War Story. He is on assignment in Iraq.